Gasketed Plate Heat Exchanger Design (PHex) is a software tool that is made to demonstrate the thermal analysis and calculations of Gasketed Plate Heat Exchangers. The calculations are performed through a series of click buttons arranged in order. Please note that the software can only do the basic design calculations the mechanical design! The software is easy to use and have the ability to calculate unknown temperatures. The plate dimensions and materials can be entered, this includes the size of plate heat exchanger and chevron angle. 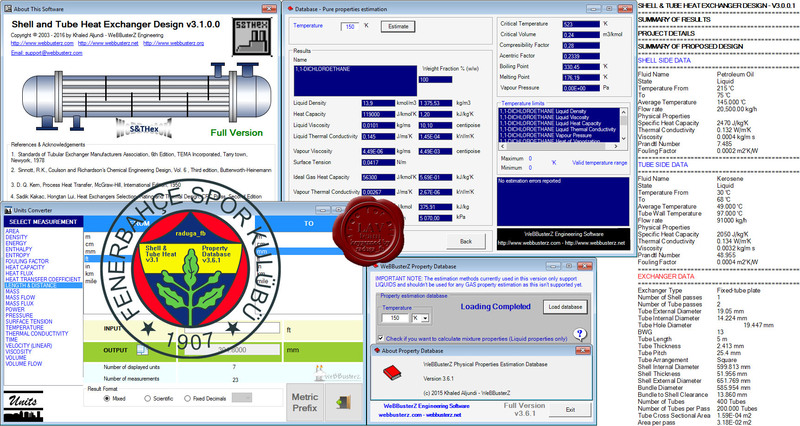 Shell and Tube Heat Exchanger Design (S&THex) is a software tool that is made to demonstrate the chemical design & rating calculations. Unlike other tools, ensures that the calculations are performed step by step to help in understanding the design calculations. Physical Properties Estimation Database has over 1400 components and can estimate physical properties for pure components based on correlations. All you provide is Temperature and the software will do the rest. The software doesn’t take into account any pressure during the estimation. If the temperature is not within the correlation range for a particular property, the software will warn against the estimation error. All mixture estimations are based on general equations for mixture estimates. The software will use the pure properties of components involved along with general equations to estimate the mixture properties.